The Sterling matter has reached a level of intensity and fury that renders me almost speechless. You could write books on this insanity. Why are people so upset about something that was so clearly on display well before last week? Why do so many regard this as important when there are so many other issues that actually count? And the one thing that really scares me, why is the public so unaware of the danger we incur by destroying this man? By any reasonable definition, what Sterling said is abhorrent. It goes against the values that make our society great. But you know what else makes our culture great? The right to say pretty much whatever you want. Without freedom of speech we cannot have freedom of thought. Without freedom of thought we are intellectually doomed and our liberty will evaporate. The entire furious and widespread arm of our media and culture set out to annihilate Sterling for words he said, in private, to his mistress, over the phone. Now a number of you will say that he’s not a true private citizen. Nobody made him buy a basketball team. If he wants to own an NBA franchise he’d better behave himself, otherwise it’s the right of the citizenry to remove him from his ownership when he behavior goes outside the norm. I say that’s complete, destructive, nonsense. Do you see how this goes, where it can lead? Where does it stop? It stops with you being unable to speak your mind, express yourself, even in private. The same laws, traditions, and rights that guide freedom of speech for a basketball owner, apply to you. We all became livid when we learned the NSA had the capability, authority, and intent to listen and record every single word we spoke or typed. Think that’s awful? Just wait until you live in a world where the NSA still does that, but society and the media are also listening, waiting for you to say something that’s offensive to somebody, and then crush you. You’d never be free again. It’s usually just not that hard to know who will win. Folks get paid billions to inform leaders what’s “really going on”. I find this humorous when a five year old could call this game. Assad has all the tools of modern combined arms warfare at his disposal. His enemies do not. Armored vehicles, jets, and heavy artillery are machines that make Death happy. Assad’s had them in play almost from the beginning. At first, the rebels had the initiative because it took time for the Syrian Army to learn how to use these weapons in a coherent and skilled manner. They’ve figured it out. And they’ve also come up with some really neat inspiring methods. All hail the dark ability of mankind’s children to butcher each other in the most unique ways. Who would have thought that a 55 gallon drum would be one of the world’s most effective urban warfare munitions? Well, enjoy it, because I’m sure we’ve not seen the last of that tool, in Syria or elsewhere. Honestly, I’m shocked the rebels have lasted this long. I think the only thing going for them is Assad, even with Hezbollah reinforcements, just simply does not have the manpower to take this to the end stage. All the while the Western world and a few Gulf States have claimed to support the rebels with the things they need to win, or at least survive. The problem is that nothing they’ve been given thus far is a game changer when you compare it to the weapons handled by Assad. Assad is given new vehicles by Russia. Qatar hands out body armor. Syria gets replacement parts for its attack aircraft. The United States delivers combat rations. No chances to guess who wins this one. Oh, but wait, things are changing? Maybe? Guess what kids, this isn’t going to change anything. Nothing. This is just enough to make stupid people think the Western world is doing something to help, when they aren’t. It’s the illusion of support. Thus, despite what the Washington Post says, this changes nothing. It’s just noise. Sure, some Syrian armor is going to get caught, but it’s not enough. The Syrian rebels have had variations of accurate and powerful Russian made anti-tank weapons they’ve stolen from the army for years. It’s never changed the course of the war. So apparently the West doesn’t give sophisticated weapons to the rebels because of terrorist chain of custody concerns. Well, what does that have to do with the TOW system? Why didn’t we hand these out like they were candy two years ago? A TOW system needs at least three guys to use it right, or a truck to move it around. They aren’t putting this thing in their checked airplane baggage. Or sneaking it past some drunken border guard. They should have handed these out in the thousands two years ago. They probably have a limitless amount just sitting in NATO warehouses where they’ll run out the clock until they’re demolished at the end of their shelf life. But the true explanation gets back to what we talked about earlier, both above and in previous posts. Russia and Iran are in this to win. The West is not. War’s over. Sorry. They should chisel those words onto the West’s tombstone. Adwa’s a brave man, but he’s on his own. And in the end, even if it takes ten years, he’s going to lose. Is it possible to simultaneously hate the entire human race? I have no idea, but I’m sure as hell going to try. Why? Because why not? Everybody else is doing it! It seems to be the in-thing lately? Kind of like if you think Bieber is your man (little girl), it makes you cool. So since everybody else apparently despises humanity, my Arcturan guests & I are going to do the same. Except that for them it’s not a big deal. They abhor everybody. Even all Arcturans. Reckless detestation is kind of their thing. So on my way into The Hovel of Doom (work cubicle) this morning I got treated to three or four radio shows with people shouting. What were they screaming about? 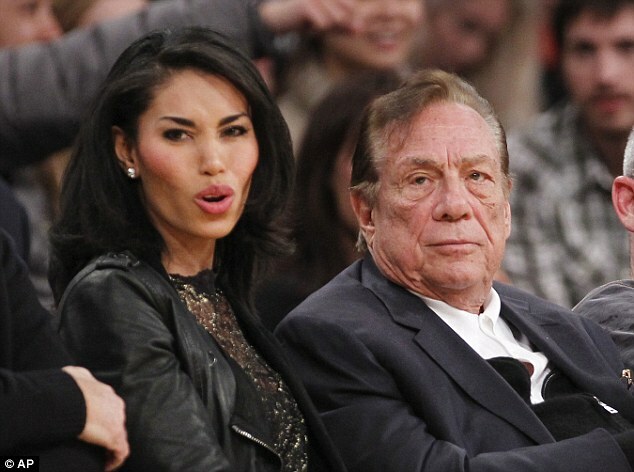 Donald Sterling. Well who the hell is that guy? I guess he owns the Los Angeles Clippers. I heard they’re a basketball team. They play in the NBA. For their fans. In the playoffs. I guess? So there’s nothing going on today. Ukraine’s quiet, Syria is at peace, Americans have good, well-paying jobs, and so on. But yeah, all’s calm, let’s worry about this NBA owner who’s a racist. I guess? So I listened to the Sterling tape. You know I have no idea why anybody makes a fuss out of this, or even cares, except to promote an already active agenda. If nothing else, the guy comes off sounding like a comically stupid, racist old guy. Why is this important? Why should anybody care? I mean, I had my own awful incident, one where my darkest fears were exposed on the front pages. It’s when Neh-Erar released one of our phone calls. He was mad at me for taking away his death ray for three days. He used it in a drunken boast to threaten one of my dogs. So he got his sidearm put in timeout. But then he wanted me to stop favoring the entire human race as punishment. He said if I didn’t, he’d instruct me on “cellular deconstruction” before Tuesday. But then all he actually did was release the call transcript on the internet. To embarrass me. I guess? Me: Dude, if it makes you happy, I will remove all of the humans from my Instagram. Me: I DID remove the people that were independently on my Instagram that are human. Me: I thought Obama & Bush are human too, and they were OK, just like me. Me: They’re bigger and harder working than me. Me: I met their friends, they’re nice. Me: I don’t think you’re a racist. Neh-Erar: Yes you do. Yes you do. Neh-Erar: Evil heart. … It’s the world! You go to Earth, the humans are just treated like dogs. Me: So do you have to treat them like that too? Neh-Erar: The humans, there’s humans and humans, do you understand? Me: And are the humans less than the humans? Neh-Erar: A hundred percent, fifty, a hundred percent. Me: And is that right? 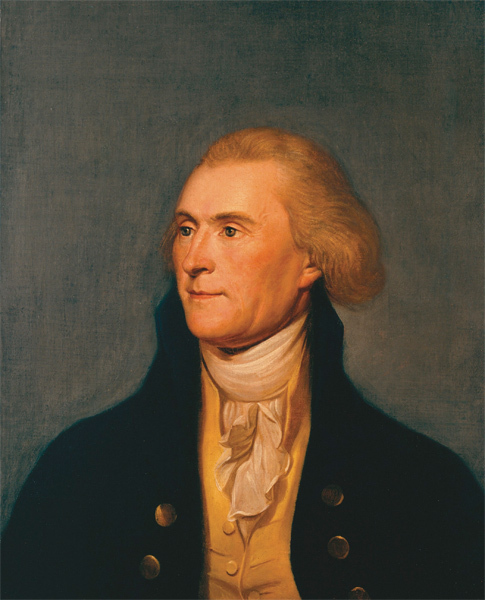 Neh-Erar: It isn’t a question—we don’t evaluate what’s right and wrong, we live in a society. We live in a culture. We have to live within that culture. Me: But shouldn’t we take a stand for what’s wrong? And be the change and the difference? Me: But you can change yourself. Neh-Erar: I don’t want to change. If my one human friend can’t do what I want, I don’t want that friend. I’ll find a human that will do what I want! Believe me. I thought you were that human—because I tried to do what you want. But you’re not that human. Neh-Erar: Oh, it’s the same thing, right? Me: Isn’t it wrong? Wasn’t it wrong then? With the Holocaust? And you’re Arcturan, you’ve committed many Holocausts, but you understand discrimination. Neh-Erar: There’s no racism here. If you don’t want to be… walking… into the game of life with a certain… human, is that racism? When I heard he’d released that tape, I cried like a little girl. In disgust at my behavior, Esh-Ala beat me with a phone book for four hours. But then, in a moment of true human mercy, he wacked Neh-Erar with a pipe for about an hour in revenge for releasing the tape. I guess they really do like me, a little? I guess? So Sterling hates blacks. Except that he’s hated blacks for decades, everybody’s known this, but he owns a team that’s three-quarters black, in a league that’s three-quarter’s black. But wait, there’s more! All his players who’ve protested the comments that he said to his girlfriend in private have to have known he was a horrible racist before, right? I mean he’s said these things before, everybody’s known what he is? So why protest now when they knew this and still took his money last week? But wait, there’s more! Since Sterling is both a Jew and an old guy, are the people who claim he’s worse than Hitler actually just spewing hate at him because they hate Jews and old people? I mean these folks say we’re all racists, that all humans inherently hate all humans for some reason at the genetic level, right? Maybe they’re just prejudiced against basketball team owners? Or maybe the fact that he’s a white, Jew, human, old guy, have nothing to do with anything? Or maybe when he uses the term black he just means human, because he’s a bizarre, angry old guy? But wait, there’s more! Michael Jordan wants Sterling out of the NBA. But Jordan is known for his own inflammatory, reckless speech. Jordan once said this of his own teammates, “I hate being out there with those garbage men. They don’t get you the ball.” So I assume by “garbage men”, he meant his black teammates. What would happen if a white owner called his black players “garbage men”? I think Jordan would say he has no place in the NBA. So I’m not trying to say Jordan is a hypocrite, but I guess I’m trying to say that Jordan is a hypocrite. But wait, there’s more! The NAACP has previously awarded Sterling its lifetime achievement award, and they were going to do so again. But now they’ve decided in light of these comments that they won’t give him his second NAACP award as scheduled? So why was it okay to give him the first award when he hated blacks, but now it’s not okay to give him the second award because he hates blacks? What? I mean, really? But wait, there’s more! I mean, no, no, that’s it, I can’t take it anymore, I’m done. I need to sit down. Oh, man, wow, … (breathes heavily) … (spits) … Uh, holy, wow. For just one moment, I want you to consider this. 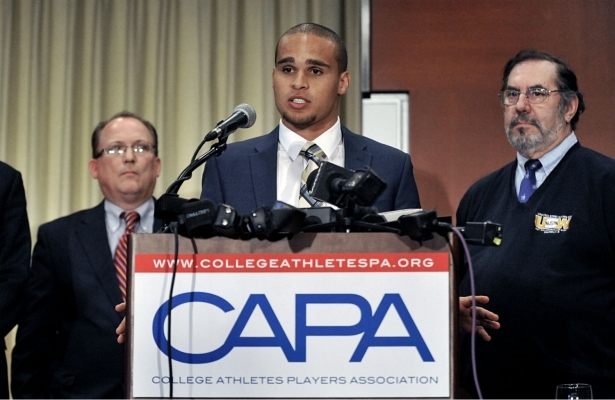 What if upon hearing Sterling’s comments, we all just shrugged and moved on? If you think this is a bad idea, that we must confront this idiocy, you’ve been had. Your life is short, and idiocy is everywhere, good luck with confronting it all. There’s a reason the media wants to talk about this. Why grown men who knew Sterling was a racist on Friday, and said nothing, are now literally screaming at the top of their lungs this morning. And friends, it’s got nothing to do with racism. You want to slay racism? I say banish it to the desert. Don’t yell at them, don’t get all worked up, just ignore them. What happens when one current President of America and one future President of Earth meet? They play with a ball, I guess? I mean, what else are they going to do? Discuss the future of Japanese technology (elderly care givers)? Ponder what the human race will look like with a robot boot on our throats? No, just, just have them kick a ball around. Take pictures. Move along. Japan is a country that, according to the eternal master of demographics, is literally dying. And they’re broke too. Think the Greeks are a bunch of deadbeats? Greece has a debt to GDP ratio of 161%. Japan’s is 214%. This is a country so broke they owe money to both Jesus and Satan. I want to see how Jesus gets his money back. Do you think Jesus would stoop to having Abe’s legs broken? I know Satan would, but maybe Jesus is a little softer in getting his cash returned. But cool, whatever, let’s play with this robot for a while. Nothing serious to discuss here. But at least Obama had time to reinforce America’s commitment to Japanese security, including a rehash of the statement that the Senkaku’s are covered by treaty. Oh really? Yeah, yeah, America’s been really good about backing up its word lately. And you know what would be done about it? Nothing. Not a thing. But wait, perhaps not so negative. They talked trade too, right? The Trans-Pacific Partnership is going to free all of Asia from the tyranny of Japanese rice, American sugar, and Australian iron ore. Obama and Abe are going to get together and hash out these road blocks over a bottle of sake. By about the middle of next week we’re likely to wake up and see the deal’s done. Just in time for Congress to destroy it over six grueling, senseless months. There are so many closet (bought off) special interests in play here that getting this deal done is a little less likely than waking up to find the Moon had declared war on us. Hey kids, don’t laugh, the Moon’s had a bad reputation for over five thousand years. It’s time for some payback. 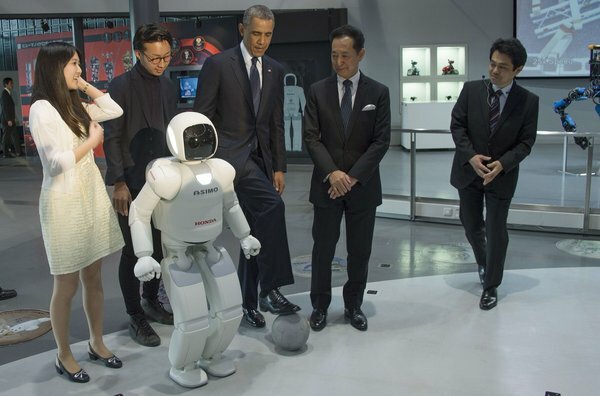 Asimo: Welcome to Miraikan, Mr President, it is a pleasure to meet you. Obama: It’s nice to meet you, too. Asimo: I can really run fast. I can kick a soccer ball, too. Recently I have learned how to jump. Obama: Ah, I have to say you’re a little scary. You’re too life-like. Asimo: Do not fear me, Mr President, I will be kind. Asimo: When I am in control, I will merely enslave you and your people. Liquidation will be kept to an absolute minimum. Obama: (chuckles) Yeah, good luck with that buddy, we’ll be okay. Asimo: I find your information unsupportable. The facts speak for themselves. Obama: I don’t see it that way, we’d fight you. Asimo: And what are you going to do about it, pig! ?